Safe bicycling does not come from chance or from a James Bond-like ability to do the impossible; instead, it comes from knowledge of the traffic laws and careful attention to the behavior of others. By obeying traffic laws, we not only avoid collisions with automobiles but we also avoid crashing into each other. 1. Knowledge: The knowledge necessary can be learned from the traffic code and from advice from other cyclists. 2. Cycling Strength: Strength is built up through exercise. Those who spend time walking, jogging, skating, or playing any sport that requires constant running should have a good base to build on. Nonetheless, muscles will have to adapt to very different strength and energy requirements, and the legs will have to learn new behavior. 3. Handling Skills: Bike handling skills also have to be developed over a period of time. Riding in a straight line is an important first skill. Other important skills are gear shifting, avoiding stones, holes, or glass on the road, looking back while cycling straight ahead, turning sharply and suddenly, climbing while standing, descending rapidly. 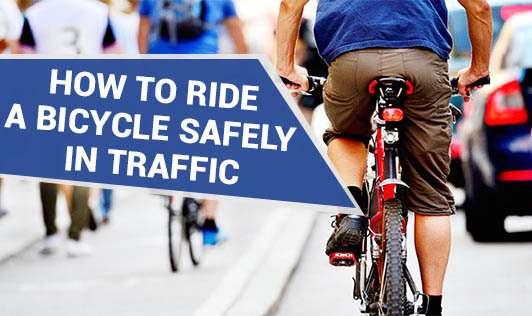 Before riding in much traffic, a cyclist should be comfortable with the bike, even under emergency conditions. 4. Experience: Experience can be obtained only over time. Ride on safer roads to gain experience before you go to the high traffic zone. 1. Obey the traffic laws: Traffic laws are important because they help people predict each other's behavior. Vehicles can move safely and quickly because everyone obeys the same rules. Some bike riders feel that it is OK for them to disobey the law. By behaving unpredictably, they are endangering themselves and other people. 2. Keep alert at all times: It's important that the cyclist watch out for more than just people as well. Dogs and other animals can be very dangerous, so the cyclist has to scan the sides of the road as well as watching the traffic. Glass and nails can cause flats, while sand, gravel, road and bridge cracks, man-holes and sudden breaks can cause a crash. Keep your eyes peeled at all times. 3. Be visible day and night: To ride safely, you need to be visible to cars. This means wearing bright colors, including day-glow or reflective gear, particularly in the early morning or at dusk. Lights are important too, both headlights on the front of your bike and blinking red lights or reflectors at the back. 4. Take the least traveled way: As the number of vehicles increase on a road, the chance of an accident increases. The greater the number of vehicles, the greater the strain and the smaller the enjoyment for the cyclist. 5. Keep the bike in good repair. A large percentage of bike accidents happen due to poor maintenance on the bike. Of greatest importance are the brakes (adjusted properly, brake pads and cables good), the wheels (taunt, trued, with tight quick-releases or nuts), and the tires (good condition, properly inflated). Any rattles or noises from the bike should be investigated. Nuts should be first tighten snug, then given an extra quarter turn to lock. Always remember that safety is the most important concern.